Damn Arbor: Should Ann Arbor's water utilities be use to support sprawl? Should Ann Arbor's water utilities be use to support sprawl? The ideas in this post were largely spawned from a tweet by @localinannarbor. And honestly, I don't do much more than add some pictures and a little history. In November 2003 City of Ann Arbor voters approved funding for the Greenbelt Program. Since then, local tax dollars have been used to leverage 20.8 million in grants, local funds and donations to conserve 4,200 acres of farmland and open space adjacent to Ann Arbor. Hopefully, this program will be able to slow suburban sprawl and ensure healthy open areas. The City of Ann Arbor also supplies areas of Ann Arbor and Scio Townships with drinking water services. In addition to the aforementioned townships, Pittsfield Township receives wastewater services. Right now there is a proposal for a new 176 house development on 162 acres of farmland at approximately 4300 W. Liberty in Scio Township. The development would need Ann Arbor drinking water due to its location on top of the Gelman 1,4 Dioxaine Plume (an area of ground water contamination courtesy of Pall Corp née Gelman Scientific). 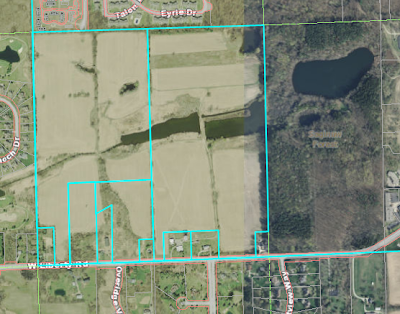 The development will also need access to Ann Arbor's wastewater treatment services, or else the developer says they will have to build their own treatment plant. Ann Arbor voters have shown that they value conservation of farmland and open spaces. They approved a millage to support this vision. It is counter productive for the City to work against our collective vision of conservation by supporting sprawl on the very farmland we are attempting to conserve with City resources. I don't know if we have an agreement with Scio Township about expanding water services to new developments. If we do, it's high time we revisit that agreement. This was a general topic that the Jan. 9 sanitary sewer wet weather evaluation study touched on briefly – at least the sanitary sewer part of things. Re: "I don't know if we have an agreement with Scio Township about expanding water services to new developments. If we do, it's high time we revisit that agreement." A couple of key points from remarks at that meeting. The agreements with surrounding townships are about capacity. The townships purchase a certain capacity in the sanitary sewer system. [I think the agreements are blind to what kind of development it might be – sprawly or dense.] It's not an option not to do business with the townships, because the federal government invested (through a grant at some point in the past) in Ann Arbor's wastewater treatment facility – and that investment was made on behalf of the surrounding townships. So the townships have (albeit indirectly, via the feds) invested in the sewer system. So based on remarks from city staff at the Jan. 9 meeting, townships actually have a legal right to purchase at least some sanitary service. In all of the modeling the city does for the sanitary system it assumes that the flow from the townships is at the full capacity purchased in the contract. The agreement with Scio Township is apparently being drafted for a renewal in 2015. A draft agreement exists but is not yet public. Seems to me that a policy review is appropriate. I would oppose expanding capacity available to the townships. Ann Arbor Township renegotiated its agreement with the City a few years ago. That process might be worthwhile studying. Thanks for filling in the background @HD and Vivienne. This doesn't take away from your main point, but I think the Greenbelt is meant to preserve some open space, not to prevent sprawl. In order to prevent sprawl, the greenbelt would need to purchase some large percentage of the area in the greenbelt district. I calculated the area of the greenbelt district to be about 88,000 acres. This means that the greenbelt has preserved just over 5% of the available space. 95% sprawl is nicer than 100% sprawl, but it isn't anything like no sprawl.